so would you maybe share your build? 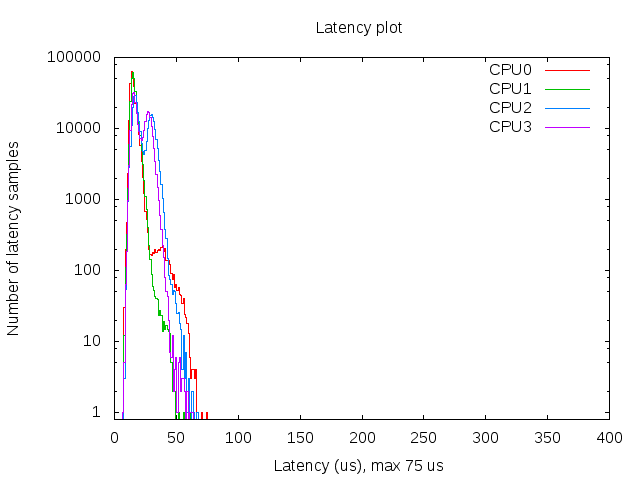 In your article you point out the approached latency of about 75 µs, but not the corresponding value of the former plain-vanilla Raspbian, so the achieved benefit remains somewhat unclear. And does the realtime system increase powerconsumption, and thus temperature of the RPi considerably? Does it need enhanced cooling now? Thank you very much for your answers – and the great work! Hello Hans, apologies for the belated reply 🙁 I can upload my builds but without any guarantee that it will work for others. Also I won’t provide any security updates or support for the builds. Good point about vanilla Raspbian test results, I will upload those. And using a realtime kernel normally doesn’t increase power consumption, it’s pinning the CPU to the performance governor and overclocking the RPi that makes the RPi more power hungry. I’ve never needed any extra cooling though. I did some test a long time ago (everything was still in black & white 😉 with netjack. The idea was exactly the same as you describe : move some CPU hungry plugins to an external server. It worked but then broke by upgrading or something like that. The MOD however, so far, seems pretty solid so it might be a good time to retry the netjack approach. Combined with a dedicated processing unit this might be a winner. Good luck and please keep us posed on your progress ! btw, i assume you are using the rj45 connector of the MOD to connect to the RPI? for some reason i assumed this was some kind of proprietary connection dedicated for the footswitches, but i guess that is incorrect, or is it ? It would be great is you could update the Howto. Or, as has been suggested, share your build. A more recent version of the patch is available here, based on a 4.8 kernel instead of 4.6. It seems to apply fine to the current 4.9 branch. Thanks for the link, I’ll check it out and incorporate it in the article. Oh and curses.h is the header of libncurses, so you need to install that first (-dev). Like Stefan said you need to install libncurses5-dev to run make menuconfig. I’ve added it to the article. Thanks both of you guys for pointing that out! Thank you Jeremy for your inspirational exploration into rt raspberry pi music. It’s frustrating to me that even thought Jackd2 package is installed with the latest raspbian distro it fails to run straight out of the gate making awesome projects like the Collidiscope along with it’s instructions, inaccessible to the non-programmers like myself. I would like to try your instructions, but as other comments have suggested (and my past failures trying these out), I would much prefer to copy a pre-made img of raspbian my micro-sd with rt already pre-configured for my rasberry pi 3. Is that a possibilty yet? Or should I try soldiering through these above instructions? I have had no luck so far with the other getting jack to run on rasberry pi instructions on linux muscian and other places on the web. My hunch is that the newer distributions of rasbarian screw up the old methods of getting it to work. Anyway thank you very much again! “error: RPC failed; curl 56 GnuTLS recv error (-54): Error in the pull function. 1. How to add failed hunk manually of dry-run patch? Add the particular code of patch to the failed file (considering the line)? In my case this particular code was already inserted but the failed message appeared. 2. What do you mean by \” Copy the deb packages to your RPi and install them on the RPi with dpkg -i\”? Please help me. Really need RT Kernel. I have a suggestion to your first question as I was looking at the source and found no reason why it should fail there. Just add –ignore-whitespace at the end of the patch command and all hunks will succeed. I already tried the new version of patch. worked well! You also have to do “sudo apt-get install kernel-package” before compiling kernel. Otherwise .deb-file will not be created. use an older version of the repository, accodring to the newest kernel found in kernel.org link above.. Very good job and thanks for this tutorial. Anyway I encounter a problem while patching. The kernel version is 4.9.80 according to Makefile but there’s no rt patch for this subversion. I’ve also tried patches-4.9.84-rt62 with no success at all. The official procedure to compile work for me! Can someone post a link of a working SD Image with RT? Also there is a tar you can just copy over an existing rasbian install. I hope it would be part or Zynthian soon. You posted that you might have guitarix running with low latency on pi 3 for guitar and MIDI. Can I get info on the config and sound card for guitar? Did you ever try to compile a new kernel? Is the mainline kernel available to RK3066? Thanks in advance. Because my UG802 still working update to Ubuntu 14.04.5 but this month he reach to the end. Hello manuti, I’ve never tried to compile a new kernel as I lost interest in the Rockchip boards. I couldn’t get them to perform in a stable manner.